It feels like it’s been ages since we’ve seen Benedict Cumberbatch’s Sherlock Holmes and Martin Freeman’s John Watson solve a good, old-fashioned mystery on BBC’s Sherlock. It probably has you wondering: will we ever see Season 4 of the series? Elementary, my dear readers. More Sherlock is definitely coming; we can now report that the next season has officially started production and it will deal at least in part with the excitement and consequences related to Mrs. Watson's pregnancy. 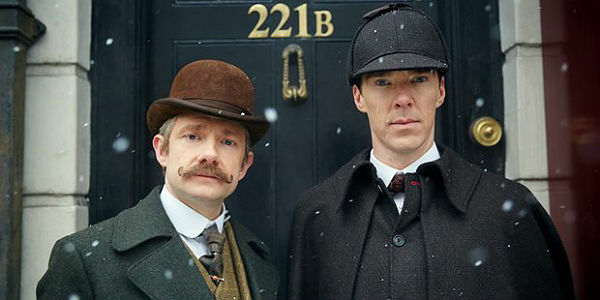 A new announcement from the network indicates that the fourth season of Sherlock has officially commenced production. It has taken quite a while for the show to assemble its cast and crew, but everyone involved in the show’s production has voiced their enthusiasm and excitement about getting back to work on the beloved series, which airs on PBS in the States. The next season of Sherlock will apparently also hold some interesting developments for the modernized versions of Sir Arthur Conan Doyle’s legendary characters. Perhaps most notably: it has been revealed that John Watson’s wife Mary has become pregnant, and the couple will be dealing with the mounting pressures of their impending parenthood. We can only assume that having an eccentric character like Sherlock Holmes around doesn’t exactly help ease the burden of this sort of scenario. On top of all of that, it appears the show will tell an incredibly gripping and engaging story that is the culmination of everything that has come before it. Series creators Stephen Moffat and Mark Gatiss have admitted the plotline in Season 4 is the "same story" they have been telling since the beginning of Sherlock itself. We can’t exactly confirm what that means, but expect past cases to have lasting, dramatic consequences. It’s not exactly a complete surprise that it has taken this long for the fourth season of Sherlock to enter production. The show’s shorter seasons film in a similar fashion to feature length films, and the BBC series’ two leads Benedict Cumberbatch and Martin Freeman have become incredibly marketable stars in major franchises. Everyone involved seems incredibly keen to get back to work on the update of Arthur Conan Doyle’s characters, but between movie and TV projects--Cumberbatch, for instance is on Doctor Strange--it has become increasingly difficult to return to Sherlock, despite the cast and crew's mutual desire to do so. Of course, that doesn’t mean our screens have become completely devoid of the oddball detective and his doctor companion since Season 3. Sherlock: The Abominable Bride – a BBC special which took the characters back to their Victorian English roots – aired earlier this year on BBC for a very excited fanbase. The event was so highly anticipated that even movie theaters opted to provide audiences with showings to complement the televised broadcast. For other shows, getting people to show up to a movie theater to watch a special might seem extreme, but Sherlock has always had some of the most engaged and interested fans on television. In fact, one superfan even wound up having a huge effect on the show when his fan theory was actually used. For those details, click to the next page. There is one from my friend Paul Cornell, a very fine comics writer. [He] came up with the brilliant theory about how Sherlock Holmes got hold of a dead body that looked like himself, based on the fact that the child screamed at him in ‘The Reichenbach Fall.’ And Mark and I looked that and thought ‘That ties off that problem,’ so we nicked it. And I’m not sure we ever told Paul. He, I think was very pleased that he’d actually guessed that. He doesn’t know to this day I don’t think that he made it up! What Moffat is referring to is the Season 2 finale and the Season 3 opener of Sherlock, which involved our hero faking his own death and then reappearing. During the Season 2 finale, “The Reichenbach Fall,” Sherlock faked his death to help rid the world of Moriarty (and to save those he loved). While a dead body was present on the scene, the end of the episode featured Sherlock Holmes hiding in the shadows while John suffered near his grave. Then, the Season 3 opener gave us a bunch of interesting theories regarding how Sherlock faked his death, including some outlandish moments but also a story from Sherlock himself, in which he used loveable side character Molly to procure a similar-looking body from the morgue. That's what ultimately hit the ground thanks to a bungee cord and her tossing the corpse out the window. With fast moves and further help from his brother, he was able to pull it off. We will bring you more information about the upcoming season of Sherlock as it becomes available to us!